Here are some simple ways of teaching your children confidence in the water, so that they can enjoy your pool. Feeling safe and being safer. One of the greatest experiences a child can have is learning how to swim. If your child can swim then they are safer on, in or near the water. They will have a skill that might simply be a pleasure, let them have some fun, be a way of keeping fit, perhaps become a sport or even the route to a career or competitive success. If your children grow up in a home with its own swimming pool, then all these things are much more likely – and of course you want your whole family to be able to enjoy your pool. And it all begins with them learning how to feel confident in the water. We’ve all seen pictures of how new-born babies seem perfectly at home in the water but that confidence seems to be something that is lost and then has to be rediscovered. At what age that process is best started is a matter for debate and personal choice. Some parents start when their baby is merely weeks old – although the pool should be at least 32deg C for this – and some wait till they are a year old. The age you begin at should be the one that feels right for you and your child and of course you should always seek the advice of a medical professional. Getting used to being wet. The first step to getting your child to feel confident in the water is the one that both of you take into the shallow end of a pool. Get your child used to being in the water with you. They see that you are happy and confident in the pool and it makes them feel the same way. Have them dip their chin and their mouth into the water and blow bubbles. Some kids are nervous of getting their faces wet and some take to it well, like a duck to water, but blowing bubbles seems to make this first stage fun. As they gain confidence, get them to get more and more of their face wet. How quickly you progress and how long a session you have at a time is down to the pair of you. Patience is important and it’s better to have a break and come back to it than push too hard. The next step in teaching children to feel confident in the water is showing them that they float. Stand behind them or beside them and get them to lie back in the water. Support the child’s head and back at first but as they relax they will realise that the amazing fact of the matter is that they actually do float. Rubber ducks float, some toys float but it always seems to come as a delightful surprise to all children that they do too. After they’ve got used to floating on their backs, get them to roll over and float on their tummy. Yep. That works too. After they’ve learned to float, teach them to kick. Hold their hands to give them support and walk slowly backwards getting them to kick as you do so. Don’t worry about what sort of kick; everyone starts off with ‘doggy paddle’, don’t they? Getting your children to feel confident in the water is one thing, but never allow them to be over-confident. Teach them. 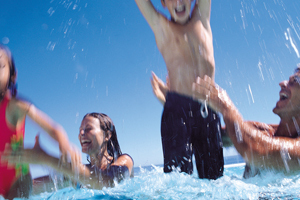 Children should always be actively supervised in and around water. When a child gets into difficulties, they tend not to shout or wave for help so you need to be watching all the time. Children should never be left alone in the pool. There should always be an adult present to supervise swimming children. For young children, the adult should remain within an arm’s length. The deck of a pool can get quite slippery and a fall at the edge of a pool can be very dangerous – so no running. Armbands and swimming aids are useful but they shouldn’t take the place of a watchful adult. If there is anything you would like to add to this article or any comments you would like to make, please use the reply box below.